You, Me and Movies: Spiderman's Cinematic World Expanding? If it was the 2000's where the superhero movie genre proved its longevity and elasticity, then the 2010's will see the superhero movie genre's world-building formula proved its longevity and elasticity. You don't need to tell me all the different crossovers in movies we've seen already, I've been talking about them for months and months. We knew a few months back that Sony has been planning on adding more heroes to the Spiderman movie franchise. But now, Hitfix today announced that Sony is planning on Spiderman spin-offs coming soon. 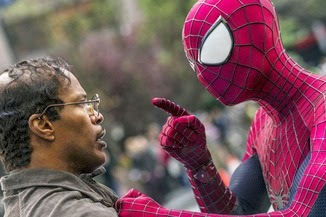 "Sony is planning a number of spin-off films involving other heroes and villains in the web-crawler's universe, according to studio chief Michael Lynton during a Q&A with analysts on Thursday. Some pretty big news, and very ambitious news. With this said, which characters do you think they will include in these spin-offs? It seems the rights for Daredevil reverted back to Disney/Marvel and a television based on the character is coming in 2015. I would say The Black Cat is a good guess however. Another big question: Is this a good idea? I think Sony maybe getting a little ahead of itself. "The Amazing Spiderman" may have made bank, but not everyone loved it. Sony made a big gamble to plan not two but three sequels to the film. Now spin-off? It seems Sony is going to keep the web-slinger busy, but will all of this work put belief back into fans? That is yet to be told. Spiderman spin-offs? Yay or Ney?